Houghton Mifflin Harcourt, 9780544808249, 320pp. At thirty-two, Faith Frankel has returned to her claustro-suburban hometown, where she writes institutional thank-you notes for her alma mater. It's a peaceful life, really, and surely with her recent purchase of a sweet bungalow on Turpentine Lane her life is finally on track. Never mind that her fiancé is off on a crowdfunded cross-country walk, too busy to return her texts (but not too busy to post photos of himself with a different woman in every state). And never mind her witless boss, or a mother who lives too close, or a philandering father who thinks he's Chagall. When she finds some mysterious artifacts in the attic of her new home, she wonders whether anything in her life is as it seems. What good fortune, then, that Faith has found a friend in affable, collegial Nick Franconi, officemate par excellence . . .
Elinor Lipman may well have invented the screwball romantic comedy for our era, and here she is at her sharpest and best. 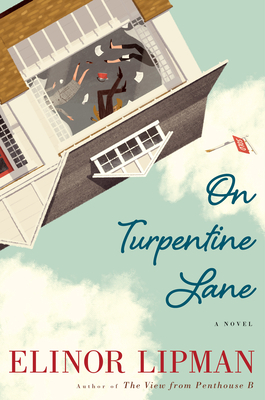 On Turpentine Lane is funny, poignant, and a little bit outrageous. ELINOR LIPMAN is the award-winning author of eleven novels, including The View from Penthouse B and The Inn at Lake Devine; one essay collection, I Can’t Complain; and Tweet Land of Liberty: Irreverent Rhymes from the Political Circus. She lives in New York City. "[Lipman] has a way of crafting books so utterly charming that you want to set up residence inside them. And yet, in a seemingly effortless balance, she’s never saccharine, but writes in a wry, warm, we’re-all-friends-here-so-let’s-have-a-drink tone . . . Like all of Lipman’s books, ‘On Turpentine Lane quickly becomes a friend." —Maria Semple, author of Where’d You Go, Bernadette? "A new Elinor Lipman novel is always a cause for celebration. And her newest will not disappoint: the story of 32-year-old Faith Frankel, who returns to her suburban hometown, where she takes a job as a professional thank you note writer for her alma mater and buys a charming bungalow home. Little does she know, the house might contain some secrets. On Turpentine Lane is another pitch-perfect, delightful romantic comedy from the beloved author of The Inn at Lake Devine." —PopSugar, "Out Favorite Books of the Year"
—Francesca De Stefano, Books Inc.